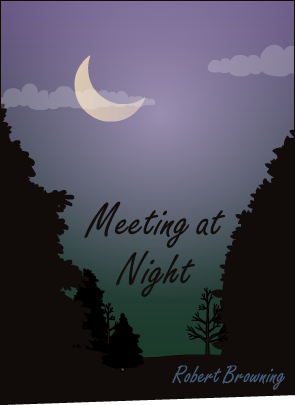 "Meeting at night" is a poem about love. It makes, one might say, a number of statements about love: being in love is a sweet and exciting experience; when one is in love everything seems beautiful to him, and the most trivial things become significant; when one is in love his sweetheart seems the most important object in the world. But the poet actually tells us none of these things directly. He doesn't even use the word love in his poem. His business is to communicate experience, not information. He does this largely in two ways. First he presents us with a specific situation, in which a lover goes to meet his sweetheart. Second, he describes the lover's journey so vividly in terms of sense impressions that the reader not only sees and hears what the lover saw and heard but also shares anticipation and excitement. Every line in the poem contains some image, some appeal to the senses: the grey sea, the long black land, the yellow half-moon, the startled little waves with their fiery ringlets, the blue spurt of the lighted match-all appeal to our sense of sight and convey not only shape, but also color and motion. The warm sea-scented beach appeals to the senses of both smell and touch. The pushing prow of the boat on the sand, the tap at the pane, the quick sharp scratch of the match, the low speech of the lovers, and the sound of their two hearts beating-all appeal to the sense of hearing. The sharpness and vividness of any image will ordinarily depend on how specific it is and on the poet's use of effective detail. The word hummingbird, for instance, conveys a more definite image than does bird; and ruby-throated hummingbird is sharper and more specific still. It is not necessary, however, for a vivid representation, that something be completely described. One or two especially sharp and representative details will ordinarily serve the alert reader, allowing his imagination to fill in the rest. Tennyson, in "The Eagle", gives only one detail about the eagle itself, that he clasps the crag with 'crooked hands', but this detail is an effective and memorable one. Robinson tells us that Richard Cory was clean favored, slim, and quietly arrayed; but the detail that really bring Cory before us is that he "glittered when he walked." Browning, in "Meeting at Night," calls up a whole scene with "A tap at the pane, the quick sharp scratch/And blue spurt of a lighted match." Since imagery is a peculiarly effective way of evoking vivid experience, and since it may be used by the poet in such a way as to convey emotion and suggest ideas as well as to cause a mental reproduction of sensations, it is an invaluable resource of the poet. In general, he will seek concrete or image-bearing words in preference to abstract or non-image-bearing words. We cannot evaluate a poem; however, by the amount or quality of its imagery alone. Sense impression is only one of the elements of experience. A poet may attain his ends by other means. We must never judge any single element of a poem except in reference to the total intention of that poem. Copyright © 2018 BloomyBooks. Watermark theme. Powered by Blogger.